This was our big celebratory “Halo Velo” team ride we’d been planning and training for all year… today was the day… it was June 16th… and it was raining! We are a group of friends who met through church and share an enjoyment of going to the pub and cycling. Sometimes at the same time. 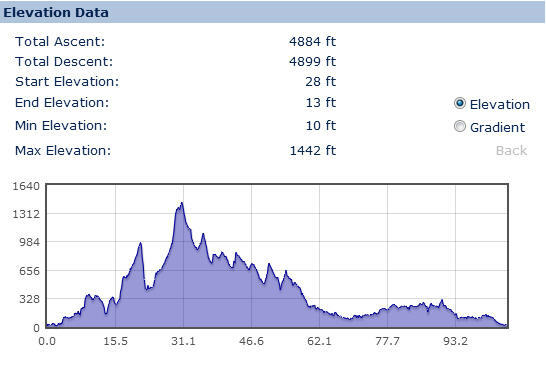 Each year we try to set ourselves a cycling challenge and we call it the “Halo Velo”. The first Halo Velo rides involved cycling around the Deanery of Stokesley visiting every church, all 25 of them, on a 75 mile route. One year we fancied something a bit different and we did a Coast to Coast from Walney Island in Cumbria to Saltburn in the Northeast. Being sensible people we chose to spread this out over 3 days and only tackle about 50 miles each day and ensure we had plenty of gentle riding and pub stops. It was our first multi-day tour. This year we set ourselves something a lot more challenging – riding the 110 miles from Redcar to Arnside in one go. Arnside is a pretty little Cumbrian coastal town and is a bit nearer than Walney Island while still being on the coast. Because we’ve done 100 mile rides before we thought that the real challenge would be a multi-day 100 mile ride, so we decided that riding home again would be difficult and allow us to raise money for Marie Curie. As with previous rides, we had a support vehicle to dig anyone out of trouble, provide a safety net for mechanical or fitness breakdowns and carry our luggage for the night allowing us to cycle further and faster than normal fully laden touring would. Bob was our support and Bob was brilliant… always there for us with water, flapjack and encouragement. In the car too was our friend Ruth who wanted to support us and Bob too and possibly ride some of the way – but crazy NHS shift patterns had reduced Ruth from relentless enthusiastic cyclist to simply being asleep. There had been a great deal of training done in atrocious weather earlier this year and we’d really hoped that come June, the sun would be shining, it would be warm and we also hoped for the magic tailwind in both directions. So – no wishful thinking there! Although only 8 of us set off, Mark was flying home from business in the USA and would join us as soon as he could – jet lag be damned. We had the pre-ride briefing and rolled out of the Majuba Road car park into Saturday morning traffic around Redcar. There are nice wide roads and easy flat cycling to get us out to Wilton where we picked up the cycle path past the works. Once into Eston and the Middlesbrough area we made sure to spread out a little because this makes it easier for cars to pass us. As usual in groups at the beginning of a ride, the pace was a little high to be sustainable for everyone and we became stretched. The first planned stop was Northallerton in the supermarket car park so I made sure to stay with those towards the back so that nobody would get lost. After Thornton we took the Seamer/Rudby road (known to us as the ‘Chicken Road’ – probably because of the chickens) which is a single track undulating route with uninterrupted views of the Cleveland Hills. The rain had eased off so I removed my jacket and kept my jacket off for most of the rest of the day, although there was the occasional shower it was a warm day. Although we left Redcar a bit behind schedule we made progress to Northallerton and arrived there to our original timetable. This was only supposed to be a regrouping spot, but in the bustle of the day it became a shopping trip for food. We spent at least 30 minutes there and plenty of pies and wraps were eaten in the car park. I suspect the nerves of the day were getting to some of the team. Food in your stomach is okay while riding, but lots of stodgy food to digest while riding is a bad idea – and it took a toll on the next section to the Three Horseshoes at Wensley. Leaving Northallerton on the A684 we planned to use this all the way to Wensley (just past Leyburn) and then stop for a pub lunch. The traffic was a lot busier now and we were getting some close passes and I understand some of the team were shouted from passing cars. Thankfully all you really hear from a shouty person is blahblahblah… disappearing into the distance, so it’s not worth worrying about. I kept to the back again making sure the last riders were okay. Cramp was attacking Adam as we came closer to Bedale and I was watching closely as we crossed a railway line, the last thing we needed was an accident. Of course he was fine. If only I’d been watching what I was doing – I slipped and fell on the greasy wet rails, bumping down in a classic three point landing. Adam didn’t notice but the following motorist (a young girl and her friend) stopped to see if I was okay. Thankfully it was just my self-confidence which was dented; and rightly so. I caught up with Adam in Bedale where he was stretching out his muscles and frustrated to have cramp so early on. On the move again we regrouped at an impromptu gathering in a layby. The fast cars and some shoutiness was encouraging the team to find an alternative and David, our man with the GPS, obliged by leading the group along sleepy little back lanes. This did slow us down a lot, the A-road would have been fast and keep us to schedule, but the back road felt safer. It twisted a lot and sometimes we felt like we were going backwards, the hills were a bit more demanding too so the pace really began to drop. This combined with Gary’s puncture delayed us further. Who ever appears happy when fixing a puncture? By the time we reached the Three Horseshoes we were so late we shouldn’t have stopped – but food was needed – and beer. So in good cheer we stopped for a pint and I had some soup (my favourite long distance cycling staple). It was good to have Sheena meet us and drop off Mark, having returned from the USA. After a break of about 40 minutes we now set off onto what we call the Askrigg road, it runs alongside the A684 to the north of the River Ure rolling up and down gentle hills but slowly rising as we travel up Wensleydale towards Hawes. I love this road and the views so I stopped regularly to take photos of the team. After Askrigg we continued rolling and had no plans to stop in Hawes, instead taking the short cut back onto the A684 at Hardraw. Here we have a series of rolling hills with less down and more up; it is a stepped series of hills which eventually bring us up to the end of Wensleydale and to the Moorcock Inn and Garsdale Head. More beer was required but for some reason coffee and full-sugar cola was being ordered – how weird. Tiredness was beginning to tell. I found that a shot of single malt followed by a pint of local ale put fire in the belly and steam in the legs – which was just as well given what was about to hit us. Leaving the Moorcock Inn it was beginning to rain a little harder, but like a fool I assumed it was another passing shower so ignored it and kept my jacket in the Carradice with my rain legs. I’d told everyone it was “downhill all the way to Sedbergh” and of course they believed me. I’ve come to the conclusion that if a cyclist says “it’s all downhill from here” you should perhaps pack some crampons. Once over the little lump of Garsdale Head we started to descend. 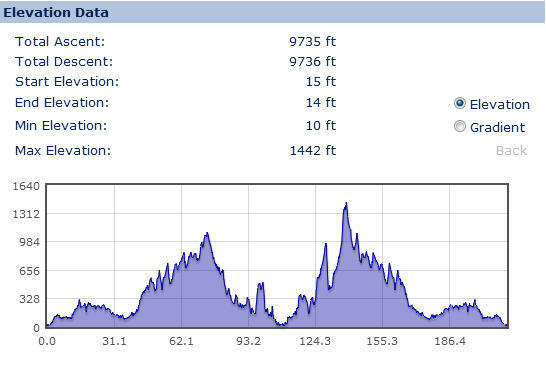 I was confident nobody could get lost and as I had 10 miles of fast descending ahead of me I decided to enjoy the ride. In the big ring I check over my should to see if anyone was following and pushed hard, the road wound down with one sweeping corner after another and the rain started to fall a little harder. I tucked in and peddled harder thinking to keep a low profile and warm legs – which was working fine. The road does go up once or twice, but if you are descending fast enough these hill just roll underneath the bike with no effort. The rain became more persistent. In fact the rain became harder. Clatter… I lost a rear light and went back to retrieve it but couldn’t find it, giving up as the rain became torrential. Instead of taking this moment to put a jacket on I opted to ignore the rain and keep going, but coming round a steep corner I saw the road submerged and slowed rapidly. (Swissstop green brakes.) As I approached the flood to ride through a motorbike came in the opposite direction and sent a sheet of freezing cold water over me from head to foot – inside my overshoes and everywhere. I was drenched. But I was smiling, it doesn’t matter I can dry off and skin is waterproof so I rode on to the next regroup in Sedburgh. The rain had finally passed and as I stood with Bob waiting for the others, my clothes drained water and as I pressed my hands together my gloves wrung themselves out. I didn’t get the camera out of the Carradice because I’d have damaged it – but I did finally relent and put on my coat. Simply now to avoid getting cold. The day had worn on and it was getting to late afternoon as everyone arrived in Sedbergh. Everyone had a hero story to tell, from salty water in the eyes to freezing hail stinging the eyes. I was still smiling, most people were – enduring difficult conditions together was making this a real team event. David had opted for a rain cape much to everyone else’s amusement – but honestly I think we were jealous that he’d had the sense to put it on. I personally like rain capes: they keep you cool and dry and cover the whole bike keeping it clean and dry. But descending like a bat out of hell with a rain cape on sounds hairy… let me rethink that… descending wearing a rain cape would make me look just like a bat out of hell. The good news is that it is downhill all the way from Sedbergh to the coast so we set off along the A683 to Kirkby Lonsdale and stopped by the Devil’s Bridge for some sightseeing. Apparently you are not allowed to jump off the Devil’s Bridge. Um. Was that a problem before? I suspect candidates for the Darwin Award. The route was out of my control from here. Although I had studied a contour map and planned a route I felt avoided the worst of the hills we decided to follow someone else’s recommendation. The recommendation had been uploaded to David’s GPS and my goodness did it find the hills! This was the final straw for Adam who simply couldn’t climb anymore, and with only 4 miles to go just couldn’t go on. We called for Bob and Stephen waited with me until backup arrived for Adam. We were sorry he couldn’t make the final section, 4 miles seems so short but the hills were still very steep and we understood how much he was suffering. So Stephen and I arrived after everyone else at Arnside and missed out on the group photo – but we did manage to have our own little celebration. We were then facing a race against time to get some food. We rushed to the YHA in Arnside, checked in, showered, changed, hurtled down the hill and made it to the pub for 8:59pm in time to order food. In fact everyone made it just in time and we had a whole area set aside for us at the last minute. The pub was running a beer festival and there was live music from a duo of singer and guitar player to entertain us. I enjoyed several ales and I really enjoyed the singing. The curry I ordered was hearty and we swapped hero stories from the day’s riding. Ruth was with us, and Bob. It was Tim’s birthday and we couldn’t have imagined a better way to celebrate than a whole day cycling, a curry, a beer festival and live music. Wonderful. Waking up on day 2 fully refreshed, we had a slap up breakfast and gathered our belongings. Many of the group were feeling stiff legged and daunted by the idea of repeating yesterday’s ride backwards but we all made our way down to the pier for a group photo. Thankfully it was sunny and warm this morning, and the wind was to our backs. As foul as Saturday had been, Sunday was beautiful. Sunshine, tailwind and… thanks to David’s hastily rerouted plan – flat to Kirkby Lonsdale. The hill of yesterday evening had persuaded everyone that a flatter start was needed and the A65 obliged. We took the B5282 out of Arnside to Milnthorpe and onto the B6384 to go over the M6. 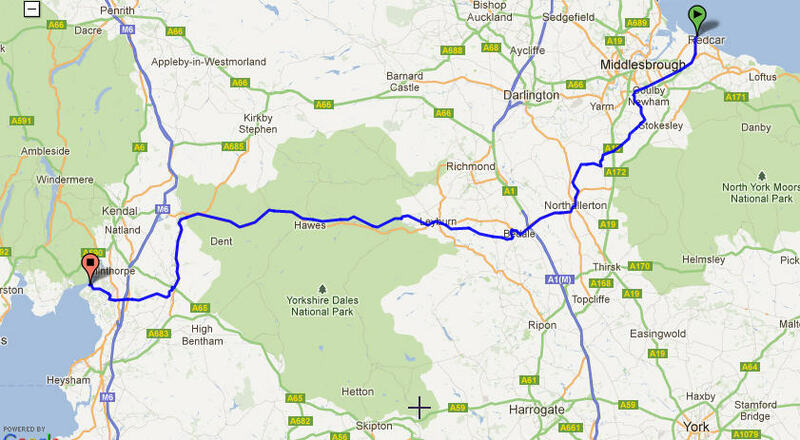 Here we joined the A65 for a fast a flat ride all the way to Kirkby Lonsdale in about 1 hour from setting off. Spirits were high and everyone enjoyed not doing the hills first thing, but the fast busy A65 had given me anxiety for my friends’ safety – needlessly as they were fine. After Kirkby Lonsdale we were back onto my planned route and we were in for a treat of a road, we took a right turn at Barbon and found ourselves on a hidden gem of single lane road up Barbondale. The hills towered above us on either side while we gently rolled up Barbondale on a smooth road surface between Calf Top and Great Coum. After the climb of Barbondale the descent into Gawthrop was an absolute tear jerker… in so far as you couldn’t see for the tears streaming out of your eyes with the speed. Coming to a halt at the junction had my eyeballs then popping from my head with the ferocity of the stop. We took a right turn to Dent and began a familiar ride up the beautiful Dentdale with the guys riding along chatting happily. I went ahead to look for photo opportunities but not very fast because the serenity and peace of the dale led me to a prayer of thanksgiving to God. Now ahead of us loomed the climb of Newby Head Gate under the viaduct and up to the top of Newby Head Moss where the B6255 would bring us back down to Hawes. At this point our ride shared the road with the White Rose Challenge, a sportive covering 107 miles of seriously hilly countryside. Two friends of ours were on this ride and here is a write up in the mtbe forum. We were all really enjoying ourselves and had only covered about 30 miles, whereas these sportive riders were about 70 miles into their challenging ride so perhaps what happened next was unfair. We had some fun. 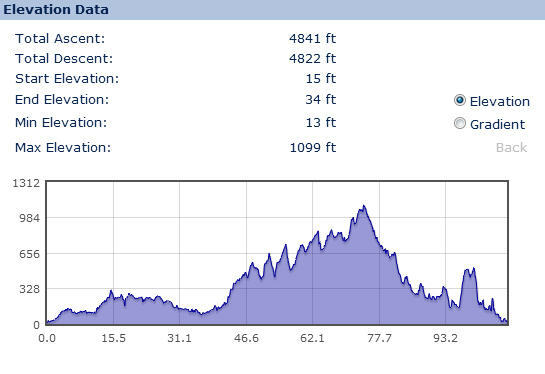 I had my tourer and Carradice and set off like a silly fool to chase down and pass as many as possible on the climb. I spoke to one guy just before the viaduct and he asked what we were doing – I said a Coast to Coast to Coast (I didn’t mention the overnight YHA) and suggested he might pass me on the climb ahead. But then shot off and left him. I passed others with a cheery “hello, are you having fun” and more still with a grin. Stephen and Jonathan double teamed one rider and that is reported in Jonathan’s blog here. We regrouped at the top of Newby Head and offered use of the track pump to riders who’d punctured – so we were good Samaritans in the end. We planned for lunch in Askrigg, which in hindsight was a mistake as we had to ride through Hawes which had amazing places to eat to get to Askrigg which had nothing convenient. However, firstly we had a blast along the B6255. This road was filled with motorcyclists hurtling along under the power of fossil fuel rather than the power of their breakfast. I decided that trying to match their pace would be lots of fun and rode as head down fast as I could. It was another wonderful series of descents with slight rises and a tailwind that kept me burning along the whole way… I rushed down into Hawes where I figured I could grab a pint of beer and wave at my friends as they cycled past. It took slightly too long at the bar so I missed all but Mark and Gary. Gary kept going and I had a chat with Mark about the pros and cons of eating here before we cycled out of Hawes together. I wish I’d had a pub lunch in Hawes because all I could find in Askrigg was a packet of Cheese and Onion crisps and a bottle of ale. The ale was my second of the day but the crisps were a let down. There was also a bit of worry among the troops that we were behind schedule again as it was now 2pm. A long stop in Hawes would have given everyone ulcers so perhaps a short stop in Askrigg worked out better. We were also concerned that we’d only covered 40 miles and that we had another 70 to go – we might not make it to the end until 9pm! Our fears were not to come true. From here on the road got easier and easier and the sun came out again enough to bring out everyone’s short sleeves. For a team feel we’d invested in “Green Eggs and Ham” shirts and the guys looked brilliant ahead of me in matching jerseys. Before long we arrived back at Leyburn and I immediately spotted the ice-cream van for a lovely afternoon “99”. Soft swirled ice-cream with a chocolate flake sticking out – yummy! We knew the A684 was the right choice to shoot back through Bedale to Northallerton and strung out like beads on a necklace we set a grand pace undulating further and further downhill enjoying feeling like cycling heroes. I managed not to fall off on the treacherous railway crossing between Bedale and Leeming Bar and before we knew it Northallerton was back – we were now so far ahead of schedule a 5pm finish was looking likely and we could stick together for the most part back to Rudby for a planned “team beer”. celebrating being so close to home with a team beer! The last stretch of the day was ahead of us, from Rudby to Redcar and we managed to stay together as a group for the final approach back through Eston and round the corner to the car park we’d set off from the day before. From Coast to Coast and back to Coast… 220 miles in 2 days. Majuba Road Car Park was full of friends and relatives and champagne and cheering kids and wives hugging husbands and a great feeling of achievement. Due to Youth Church commitments my wife couldn’t join the celebration and asked if I’d mind cycling back home… Well, of course I’d like to cycle home. And the extra nice thing was, with a bit of wiggling on the route I topped the distance for the day up to 200km. With one final beer, back at the Fox Covert on the outskirts of Ingleby Barwick I concluded a grand couple of days out with wonderful friends.